View More In Document Frames. Americanflat looks beyond the frame. We are dedicated to providing quality frames that will allow your keepsake to be prominent and maintain its distinction through time. Our Black Document Frame comes with an acid-free white mat that holds an 8.5 x 11 inch document with mat or an 11 x 14 inch document without the mat. 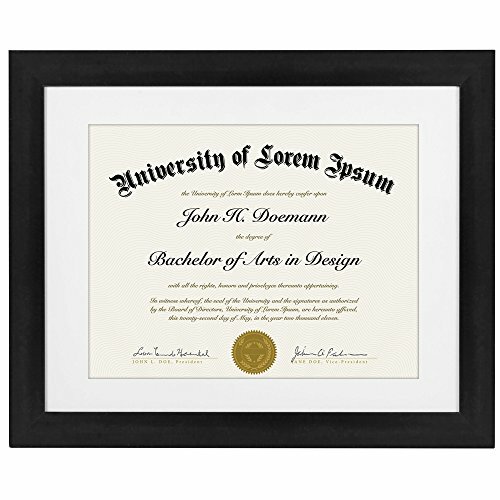 This frame is great for displaying your diploma or certificate with pride. Our Black Document Frame is crafted for durability and the glass front will preserve your document for years to come. It is simple and easy to use. The easy-open tabs allow you to load your document quickly and fit securely. Order your Americanflat frame now and join thousands of other satisfied customers who LOVE the Americanflat experience. DESIGN: Sleek professional black molding and precisely cut white mat makes your document to look distinguished. Made using the highest quality materials. USE AND DISPLAY: Displays 8.5x11 inch documents, certificates, diplomas and photographs using the mat, or 11x14 inch documents without the mat. Perfect for your home or office. The actual mat opening is 0.5 inch smaller, 8x10.5 inches. QUALITY: Sturdy frame that is built to last. Clear glass front preserves and protects your document. FEATURES: Comes with hanging hardware which can be installed vertically or horizontally. Easy to hang and display. PROTECTIVE PACKAGING: Americanflat developed exclusive proprietary packaging that helps ensure safe delivery of fragile and glass items. Order with confidence, click and add to cart today. If you have any questions about this product by Americanflat, contact us by completing and submitting the form below. If you are looking for a specif part number, please include it with your message.